1. Preheat the oven to 180˚C, gas mark 4. Put the cream, rosemary and garlic in a saucepan; season and set over a low heat. Bring to a simmer then take off the heat and set aside to infuse for 20 minutes; strain and discard the aromatics. 2. Cover the base of a 1.8-litre ovenproof dish with a layer of the infused cream. Add a layer of potato then a layer of Jerusalem artichokes (or celeriac). Season then add another layer of cream, spreading it out to just cover the surface. Repeat all the way up until the dish is full. Cover with foil then bake for 1 hour. Remove the foil, sprinkle the cheese evenly over the top then return to the oven for 20 minutes, or until the Jerusalem artichokes are tender and a butter knife cuts through them easily. 3. Meanwhile, make the crumble. Spread the hazelnuts out on a baking tray and roast for 8 minutes. Add the oats to one side of the tray and cook for another 5 minutes. Chop the roasted hazelnuts and set aside. Melt the butter in a pan over a medium heat. Add the onions, garlic and thyme; season. Cook slowly for 10-12 minutes, until the onions are soft. Remove and discard the thyme sprig, then stir in the oats, chopped hazelnuts and the parsley. 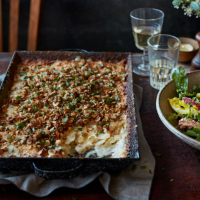 Serve the gratin with the crumble scattered over the top and dive straight in.